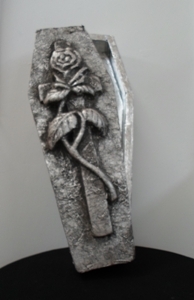 Small coffin which is covered with a type of foil with a separate lid. The lid has a rose entwined with a cross. Measurements 68cm in length & 11cm high.